Well Done Lewis! UK Number One. A huge congratulations from everyone here at St Luke's to our very own, Lewis George from 6P. At just 10 years old Lewis is ranked Number 1 in the United Kingdom for Thai Boxing. Lewis now holds the North West Title and The English Title. he has had more fights in between winning the belts. He has trained very hard and has not let it get in the way of his school work. 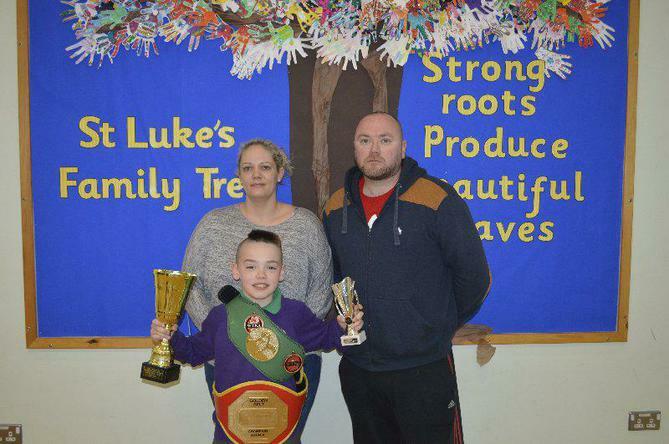 Last Sunday Lewis competed against a 12 year old boy who has never lost a fight...until now!! Lewis won the fight which was stopped in the 3rd round due to his outstanding technique and strength. As you can see from the photograph, Lewis now has some fantastic belts and trophies that he can treasure for years to come. We are all very proud of you Lewis - nearly as proud as your Mum and Dad!